Elizabeth Hausler Strand is Founder and CEO of Build Change, a non-profit working in developing countries to build houses and schools that don’t collapse in earthquakes and typhoons. In this interview she speaks about how her experiences in dealing with the havoc wrought by disasters has taught her how to give her social enterprise maximum impact. The text of the interview plus more details of Build Change’s work can be found below. There are two basic problems Build Change is trying to solve. The first one is the number of deaths, injuries, and economic losses that often happen in emerging nations when there is an earthquake. It’s not the earthquake that kills people. It’s the collapse of a poorly built building. So this is a man-made problem, and there has to be a man-made solution. The second problem we’re trying to solve is how the relief agency industry has traditionally approached post-disaster housing reconstruction. Usually, they bring in a bunch of contractors to build large numbers of houses for people at a high cost per house. There’s a lot of corruption and poor quality constitution and very little opportunity to build local skills and contribute to the local economy. So we’ve been working with the relief industry to change the way post-disaster reconstructions is done. When the Indian Ocean tsunami happened in Indonesia in 2004, we started our first program in Aceh to help people rebuild after that disaster. Because I was a bricklayer, I could actually go out and train masons how to lay bricks. We hired local engineers and local architect and we trained local builders. We got our hands dirty trying to figure out how to actually build an earthquake-resistant house that is affordable, low-cost, uses locally available materials, and is preferred by homeowners. Once we figured out how to do it ourselves, we started open-sourcing our methodology. We shared our design and construction guidelines with other NGOs. We trained their staff. We supervised their construction. We trained their builders. And we were able to increase our impacts by a factor of 100 by doing this. When we started working in China after the 2008 earthquake, we had more ability to enforce building standards by partnering with the government. They gave us these IDs that made us look like government officials and we would go out and inspect the buildings, train builders on the job, and report back to the government. The government would create incentives for builders to build safely by offering them more contracts and more work, and this was a very, very successful partnership that allowed us to scale up to over 1,000 houses in a short time. Build Change works very closely with the private sector, everything from the small-scale local builder, the local building material producer, on up to financing institutions, insurance companies, and large-scale contractors and material suppliers. We’re not expecting homeowners to build the house themselves. We’re expecting them to hire a local builder who produces their house. So the private sector provides the supply for safe construction while the homeowners have to demand safe construction. Our role is to identify the business models to enable the local construction businesses to really thrive. We look at their technical processes, cash flow, and marketing, and we help them to produce safer building materials and create more jobs. A barrier to scale in what Build Change does is getting enough engineers, architects, construction professionals out in the field assisting people to build safe houses, training builders on the job, working with building materials producers. Most governments just don’t have enough engineers or large enough budgets to get people out in the field working with homeowners to build safe houses. So we’ve hired and trained hundreds of our own engineers, and we’ve also worked with partner agencies- governments, NGOs, technical training institutions – to train their engineers and construction workers as well. We’ve been expanding our model from a direct service approach to a system change approach. We’re still implementing programs on the ground. We’re still training builders. Our engineers are still out in the field working one on one with homeowners to build safely. But we’re continuing to advocate for better approaches to post-disaster reconstruction. We’ve worked with USAID to write a primer on this approach. We’re working with governments from the start, right after a disaster, to change the way they approach the reconstruction. This is now a core part of our model. 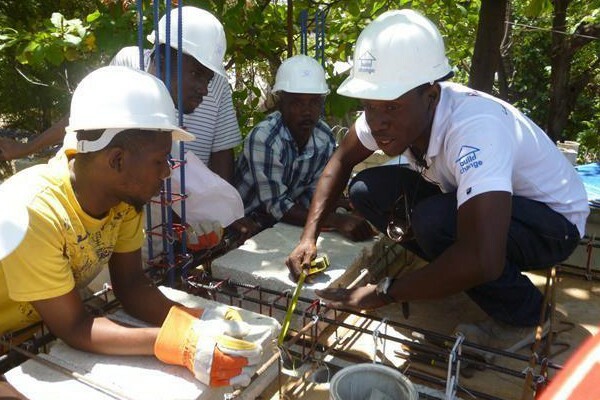 In Haiti, we have a partnership with the Ministry of Public Works to create the first-ever guideline on retrofitting, or strengthening, existing buildings. We’ve used those guidelines to train government engineers. In Colombia, we have a partnership with the Colombian government in which we are training the Colombian Government Vocational Institution. We’re doing a train the trainers. We’re training their team to train other builders in how to build safe houses. And we’re also partnering with the government subsidy program to use that financing as leverage. Because we’re working in an environment where building code enforcement isn’t common, we need to partner with the institutions that provide the financing to make sure it is contingent upon meeting safe standards for construction. Over the years, we have evolved or, I guess, better defined our theory of change and the barriers to scale for what we do. And it really comes down to money, technology, and people. We have to have the right technology. It has to be locally available. The builders have to have the skills and tools to build with it. The architecture has to be appropriate for the climate. And so we’ve got to get the technology right. On the money side, it has to be affordable. If people don’t have enough money, they’re not going to build a safe house. We are increasingly using financial incentives and insurance incentives to encourage people or to compel people to build safely. We work with subsidy programs in which you cannot access the subsidy unless you agree to meet the minimum standards for safe construction. 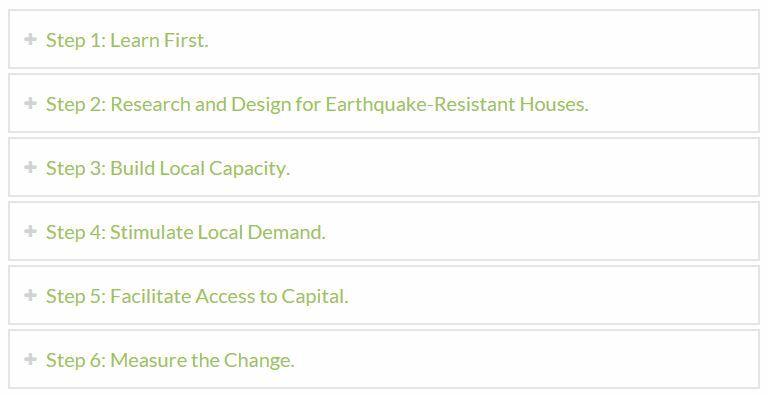 On the people side, someone has to want a house or school to be earthquake or disaster resistant. We can train all the builders in the world and produce that supply, but unless we have the demand, it’s not really going to scale. So we work with governments to enforce building standards and we work with homeowners so they understand how to build a safe house and can demand it. We use social marketing and social media to get the word out to massive numbers of people about how to build houses safely. 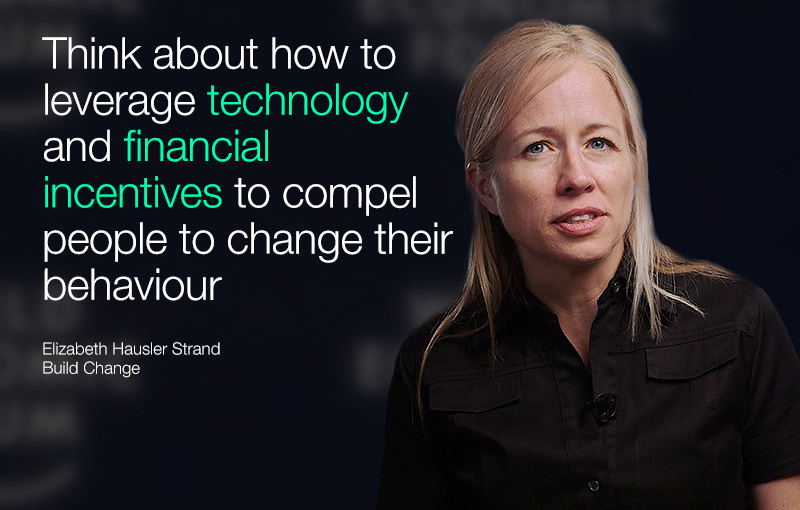 I recommend you consider how this “money technology people” model applies to what you are doing: how to get the right financing in place, how to make sure the technology is appropriate, and how to compel people to really change their behaviour. Author: Elizabeth Hausler Strand is the Founder and CEO of Build Change. She is a Schwab Foundation Social Entrepreneur and a member of the Global Agenda Council on Risk & Resilience. For more on Eliizabeth’s work see How the private sector can soften the blow of disasters and How Colombia is preparing for its next earthquake.